According to The Cookbook Library, a new book on the history of printed cookbooks by Anne Willan and Mark Cherniavsky (Univ. of California Press), cookbooks date back to medieval times. It is not that uncommon for Friends of Libraries groups or other library supporters to compile cookbooks to raise funds for a library. I recently acquired a hansom example that was published this year by the Friends of Matheson Memorial Library in Elkhorn, WI. 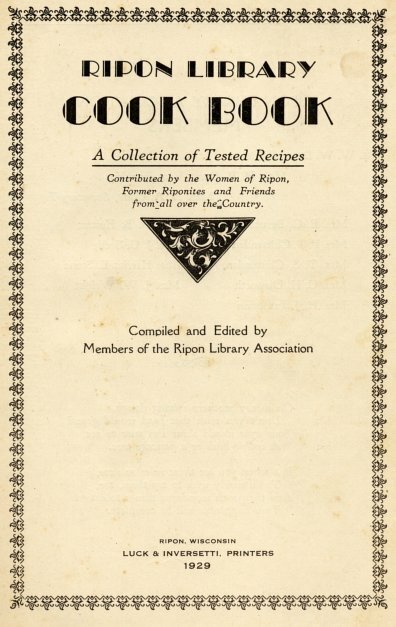 I have a much older example of a library cookbook that was compiled in 1929 by the Members of the Ripon (WI) Library Association. My 1929 copy is the fourth edition of the publication. The first edition was published way back in 1892. It got me to wondering when the first library cookbook was published. It might even be the 1892 Ripon cookbook. I found a citation for a Grinnell Iowa Free Library Cookbook in WorldCat that was published in 1896 and a citation for cookbook published by the Aldrich Free Public Library Friends in Moosup, CT in 1897. I currently only have three cookbooks in my librariana collection, but a quick search of eBay leads me to believe that one could put together a nice collection of these books. According to a brief history of the Ripon Public Library, the Ripon Library Association (a subscription library) was created in 1884 and turned its book collection over to the city for a free public library in 1898. The Library Association evidently continued as a library support organization.